Clogged gutters can erode landscape, flood basements, rot wood, shift walls and crack foundations – all of which can cost homeowners thousands and thousands of dollars to repair. When it comes to home maintenance, keeping rain gutters clean and clear of debris isn’t anybody’s favorite project. But that doesn’t mean it’s just another maintenance issue to be swept aside; clogged and neglected gutters can ultimately destroy the foundation of your home. Old or new, every home needs a gutter system in place to protect its foundation. A gutter’s job is to channel rainwater away from your home’s foundation into a drain or out further into the yard to prevent water from settling where it shouldn’t. When leaves and debris build up in gutters overtime, some or all of the water that was supposed to be diverted can eventually cause homeowners all sorts of problems in and around the home and garden. Moving over the side of the gutter or going behind it, water can erode landscape, flood basements, rot wood, shift walls and crack foundations — all of which can cost homeowners thousands and thousands of dollars to repair. Delphin Thebaud, Regional Marketing Director of Gutter Helmet by Harry Helmet®, says clogged and improperly working gutters, which often get little attention, are generally the No. 1 cause for wet basements and even foundational repairs. 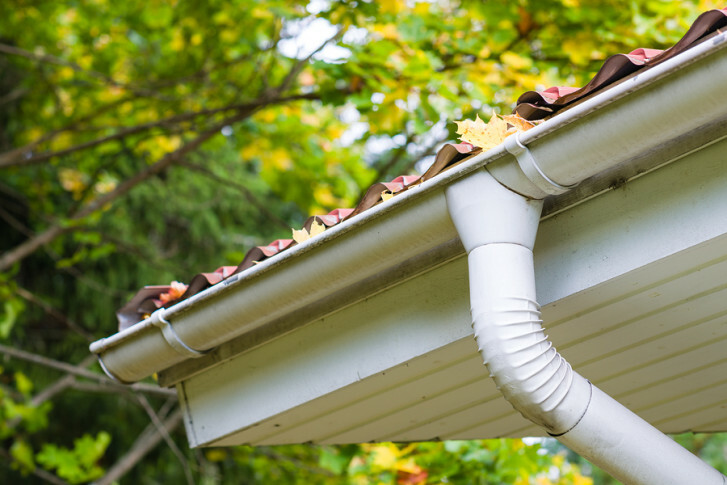 Gutters may be one of the least favorite home improvement projects, but they are an integral part of home maintenance. From a ROI standpoint, Thebaud says, maintaining your gutters can be one of the best preventive maintenance jobs you do to protect yourself, your home and your wallet from unnecessary expensive repairs down the line. Sometimes finding the clog in your gutters is not as easy as surveying just the open part. Once debris has found its way into your gutter system, it can move until it reaches the downspout and eventually clog it. A downspout cage, usually made of wire mesh, acts as a strainer and allows water to flow through the gutters while trapping debris. However, if the mesh becomes damaged, the debris can find its way into the downspout and form clogs. You can use a variety of methods to keep gutters clean and flowing. Remove sources of gutter debris by planting trees away from your home or ensure gutters are working with your roofing system by maintaining your roof. Hire a company to clean your gutters to save a lot of extra work or clean them yourself. Consider the true cost of calling a gutter-cleaning company — having them come to your home two to three times a year — and compare those monetary costs as well as peace of mind against finding a permanent solution to keeping your gutters clear and free-flowing. Permanent solutions such as installing a gutter guard add a protective cover to your gutters that manages the flow of rainwater and sheds debris so your gutters will never again be clogged, making the task of gutter maintenance easier than ever. Learn more about Gutter Helmet® and how it can turn clogged gutters into an effective, low-maintenance gutter drainage system for your home.